Polyglactin 910 purple USP 4/0 EP 1.5 L-75cm HR-20. The thread based on Polyglactin-910 is a synthetic absorbable surgical material based on Polyglactin-910. To reduce capillarity and wickedness, reduce the "sawing" effect when carried out through the tissue, as well as to improve the reliability of the surgical site, a film coating of a resorbable polymer is applied to the thread. Suture material Polyglactin 910 dissolves during hydrolysis, causing minimal initial inflammatory response in the tissues, followed by the formation of a connective tissue capsule. Resorption begins with a loss of tensile strength, followed by a loss of mass. 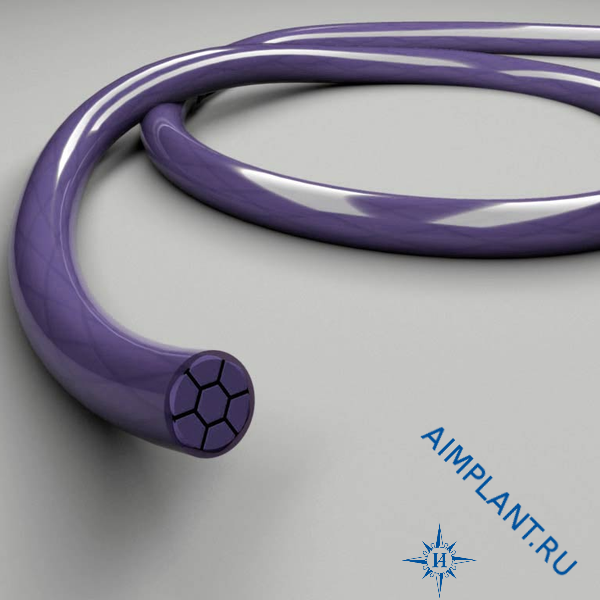 All the original tensile strength is lost after 4-5 weeks after implantation. Term of containment of tissues 21 days. Complete resorption usually occurs after 50-80 days. Resorption period: 1st week-90% residual strength; 2nd week-65%; 3rd week – 50%.